After studying and sifting through consumer reports, we at Faucet Mag, have compiled a list of Glacier Bay Faucet reviews so you won’t have to spend hours reading through reviews as we did. Glacier Bay is the house kitchen and bath product line for the popular retail store Home Depot. Because this company specializes in home improvement, it makes sense that they would create their own brand and product line to market to their customers. The question is this: Are these “store brand” faucets of good quality, or is it better to go with a company that specializes in making faucets? Read on, and decide for yourself. 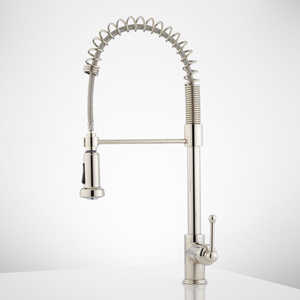 The Glacier Bay Single Handle Pull-Down Kitchen Faucet is a teapot style similar to the Pfister Avanti, yet unique in its own way. This faucet that can be described as both elegant and functional. 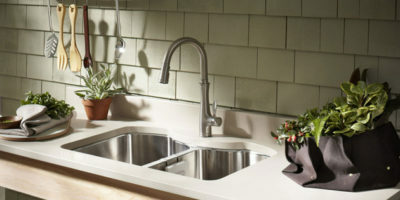 The Glacier Bay Single Handle Pull-Down Kitchen Faucet is Glacier Bay’s mid-range model. It stands out amongst the other models with its curvy teapot style silhouette and also boasts a few bonus features. This model has a pause function, unlike the other models mentioned above, and also boasts the most height and extension length. It can be installed where there are 1, 2, 3, or 4 holes and has shorter spout reach, which leads to solving the pesky splashing problem that is invariably complained about without extra adjustments being made to your home’s water pressure. The main difference with this faucet is the design. The teapot design is an elegant one, better suited for classically elegant décor, rather than an industrial look. The pull-down sprayer is so unnoticeable, it lends well to the simple design of this beautiful faucet. The number one complaint about this faucet is that it doesn’t retract all of the ways, or rather that the magnet isn’t strong enough to hold it into place. There are numerous complaints of the faucet detaching itself from the magnet, simply because it is turned on, and the water pressure is too strong for the piece to hold. Water pressure seems to be an issue in so many cases, such as in the backsplash issue, and turning the water pressure down will likely help in this case. I could also recommend removing the restrictor, as recommended by the manufacturer in response to the backsplash problem. We have a hunch that this problem may stem from the same place and that the same solutions will help. The Glacier Bay Market Single Handle Pull-Down Faucet is a pull-down faucet on a budget. The first thing to be said about this faucet is that is is stylish and has a fantastic price tag for being a pull-down type faucet. Most customers said that they found this faucet to be beautiful and functional. With the reach required to reach every corner of your sink (no matter how large), and two spray modes to gently rinse or powerfully spray, this sink is great for getting the job done. It also has the popular “swan- neck design”, with a high arc that lends grace to your kitchen. With brass housing, the faucet is designed to be durable and last. The instructions are also reported to be simple to read and follow. When researching this faucet, there was one very specific problem that came up again and again. Apparently, the nut that comes with the faucet to mount it is sized incorrectly. Some owners reported that the faucet “had played in it” or was loose. This can be remedied, though, by simply purchasing a nut in the correct size. Some even reported leaks that I could surmise stem from the same issue of the nut not fitting properly to make a seal. With the price of the nut and the price of the faucet, it can be argued that it is worth it. Others will argue that the company should make more of an effort to send the right sized nut in the first place. Still, others complained about water pressure or having problems with the hot water not coming through properly. All in all, the complaints about this faucet almost outweigh the pros, but you essentially get what you pay for with this one. The Glacier Bay Invee 8 Inch Pull-Down Kitchen Faucet is very similar to the Market in functionality but is a bit more expensive with fewer customer complaints. The Glacier Bay Invee 8 Inch Pull Down Faucet has significantly fewer complaints than the Market. 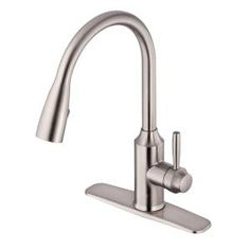 In fact, it is very similar in design to the popular Moen 7175 Level One- Handle Pull Out Kitchen Faucet listed on Faucet Mag’s list of best-rated faucets, but with a significantly smaller price tag. 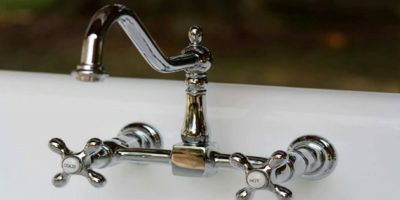 Some consumers even specifically stated that it was superior to their previous faucets that were more expensive from the more expensive and popular name brands. This faucet also includes the deck plate, which you have the option to install or leave off entirely. It is a beautiful faucet either way, with quality that is comparable to the larger, more expensive well-known brands. The ceramic disc cartridge performs for years even under the roughest conditions such as in residences with hard water. This faucet has a wide angle that can reach the outer edges of your sink, but that can also leave you wet after being splashed. Because Faucet Mag editors spend time pouring over reviews, we have come to the conclusion that this is a common complaint about faucet owners for almost every faucet. Most of the time this can be remedied with a simple adjustment to your water pressure. 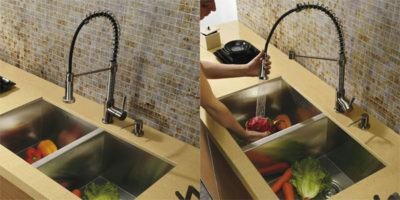 With this sink, it was pointed out from more than one customer that the spout extends past the center of the sink, and therefore hits the sink at an angle that causes water to splash up. This can be inconvenient, but if you take the time to make the adjustment (or simply ask the plumber to do it while under there if you’re not much of a handyman/woman), it should compensate for the width of the arc. If your sink is wide enough, this may not be a problem at all, so it is always recommended that you keep your current setup in mind when adding a new component. One customer even reported buying a larger sink because they loved the faucet. 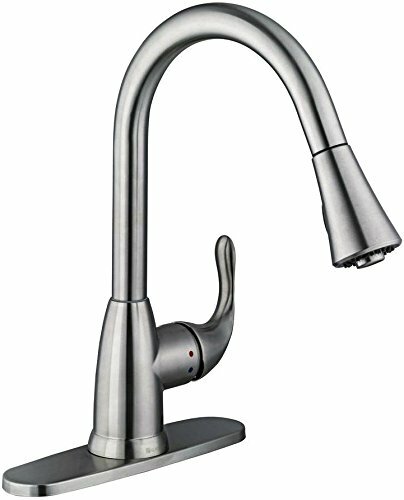 The Glacier Bay 400 Series Single Handle Pull-Down Sprayer Kitchen Faucet boasts a modern, almost futuristic look that will make your kitchen look state of the art. The Series 400 Single-Handle Pull-Down Sprayer Kitchen Faucet falls into two categories at Faucet Mag: commercial style and pulls down. 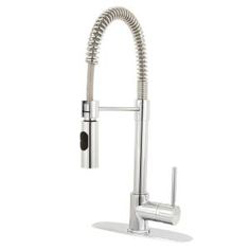 It has the spring style sprayer found on industrial style faucets but is compact enough to fit nicely into your residential kitchen if the industrial look is not what you are looking for. It features a high-arc spout that reaches 8 inches and a sprayer with two spray functions for you to select which mode fits the job you are trying to accomplish. With this faucet, the usual complaint about water splashing everywhere came up yet again. However, I found this response from the manufacturer regarding the issue: “The issue mentioned is usually a result of not flushing the line before installing the faucet. Sediment from an old faucet can backwash into the water line when disconnected then when the new faucet is placed back on the sediment can clog the restrictor. To solve this issue just remove the restrictor.” There were also two troublesome reports that stated that the faucet broke in half. Though it is true that this is probably a rare occurrence, and that of the many faucets sold, only two consumers reported this problem, it was worth noting. Some people reported that it was hard to get in touch with Glacier Bay and that their phone number was hard to find. This information seems a bit outdated, though, as us Faucet Mag editors had no trouble finding the number at all, and will pass on our good fortune to you. Glacier Bay Customer Support can be reached at 1-855-HDGLACIER. Glacier Bay is a Home Depot house brand that some may dismiss right off the bat without even considering buying one. However, we at Faucet Mag believe this is a mistake. It is a true adage that you get what you pay for, yet with such low prices, making an extra adjustment or two is a fair trade. Honestly, they stack up well against competitors, making themselves a true bargain at the price. They also offer a much like the more expensive brand’s offer. This company boasts that their sinks install in less than five minutes, and we found their instructions to be easy to read and follow. However, if you find installation instructions to be foreign and prefer a video reference, look over this how-to video before you install. This company has a wide array of how- to videos on their products, leaving even the most inexperienced do- it- yourselfers feeling confident in their ability to install their new Glacier Bay faucet themselves. All in all, though, Glacier Bay is the lowest end brand for a big box store, and essentially you get what you pay for. Home Depot gears themselves towards do-it-yourselfers, but you may find yourself doing it over and over replacing parts that wear out. However, with their limited lifetime warranty, this is all at no cost to you up front, though it will cost in time spent replacing the necessary parts. If you’re less of a do- it- yourselfer, the plumbing bills may add up as well. The upside to this whole scenario is that replacing parts is normally even easier than installing (though sometimes the opposite does apply) and can sometimes be completed in mere minutes without professional help at all. As an added bonus, videos can be found instructing you how to replace almost any part for you visual learners out there. 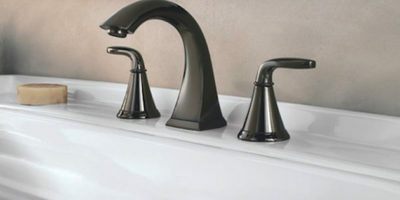 Glacier Bay overall is a sound brand for what it is, which is a cheaper alternative to the more expensive faucets. Although you get what you pay for, with a little work you can have them perform well enough to do what you need to do. They also come in various styles, such as the teapot Single Handle Pull-Down or the commercial fusion style Series 400. 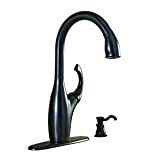 There are two high arc pull-down models to choose from reviewed here, the less expensive Market single Handle Pull-Down faucet and the more sturdy Invee 8 Inch Pull down faucet. With the price, you may require a little more work, but there is a happy medium to be found in their mid-range models such as the single handle pull-down faucet and series 400. Generally speaking, if you’re looking for a faucet on a budget, these Glacier Bay faucet reviews should point you in the right direction of which one will fit your budget (and your skill set).